Find hotel near National Exhibition Centr .. The National Exhibition Centre is, as it claims, the UK’s most exciting venue. Now, you’re probably thinking- so it’s just a venue. What am I supposed to do in an exhibition centre? What you need to know is that the NEC is the busiest exhibition centre in Europe, which means that there is always something happening there, be it the British International Motorshow or the Pokemon Video Game World Championships! Apart from hosting expos, fairs and massive exhibitions, the NEC is home to a number of annual events, which are always delightfully entertaining. These events include the Autosport International, the Crufts Dog Show, The Horse of the Year Show and the Warley National Model Railway Exhibition, to name just a few. 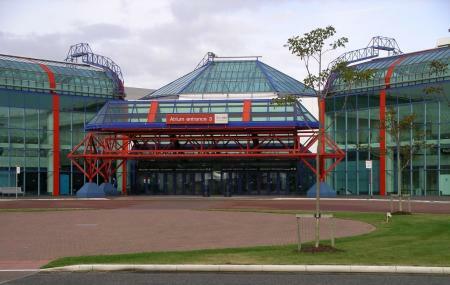 If you’re lucky, you’ll be visiting the NEC during the International Spring Fair, which was its very first event in 1976, and is now one of their biggest annual occurrences. On most weekends, you can catch Young Driver racing events for 11-16 year olds at the NEC car park. The LG arena, which is part of the venue, is a state of the art musical facility which has house some of the biggest names in the world of music. Almost every major artist, from Britney Spears to Metallica and a whole lot more in between, has played in the LG Arena, making it one of the most popular live venues in Europe. When you’re in Birmingham, this is one experience that you shouldn’t miss. All you have to do is check the schedule on the NEC website for the latest events, and you’re sure to have a blast. Also, visit the popular attractions in the city by following Birmingham itinerary 1 day. There is plenty of space for parking your vehicle outside the centre. Free shuttle bus services are always running between the car parks and the halls when there is an exhibition taking place. There is free Wi-Fi available to all visitors at the centre. In case of any emergencies, trained medical staff is available at the venue at all times. There are many options for food and drink inside the venue, ranging from fast foods to waiter service restaurants. The entire venue is equipped to help the disabled, with exclusive changing rooms and toilets available to them. Coach services are operated by National Express and Megabus, from here you can get to the NEC in minutes on the free air-rail link. How popular is National Exhibition Centre Nec? People normally club together Library Of Birmingham and Birmingham Back To Backs while planning their visit to National Exhibition Centre Nec. Had a great time. Came on trip for the Big Bang fair, plenty of exhibitioners with their new concepts and products. There were loads of activity for children to take part in and some were also very rewarding. The place does get very busy and it’s huge to explore, legs do give up after 2 hours so make sure to take Some rest. Loved this place. Was worried about parking g and directions etc but it was super easy and just 5£ to park. Loads of signs and real easy to find. Staff all very friendly and helpful. Thought food was going to be extortionate however I found it reasonable considering they have a monopoly over you. 4.25 for a subway so not bad. Toilets were ok, better than other places I've been. Cant wait for the next insomnia! Easy place to travel to and plenty of parking. Good free bus service to car parks. Train station also on site. All undercover and warm. Bars and cafes a bit expensive. Especially as your a captive audience. Exhibitions I have been to have all been great. Attended the Caravan and Camping show. It was brilliant with lots of exhibitions to wander round. Food and drink was not too expensive but we took our own packed lunch so only bought coffee and snacks. the toilet facilities were very clean and there were plenty of them around. A Good venue to visit. Always a great place for events. Hotels are situated close by and aren't the insane prices of London excel. I go for comic con and it's always been my favourite at this venue. Family groups are very welcomed and we'll catered for. Starbucks is situated at both sides of the arena as well as whetherspoons. Only problem is it shuts at 8! So be quick! The variety of events at this venue is vast. From craft fairs to camera shows, bike shows to live events, you name it they've got it!